On Monday, 21/09/2015, a football math between 2 teams of Burj Al-Luqluq players took place on the football field of Burj Al-Luqluq center. 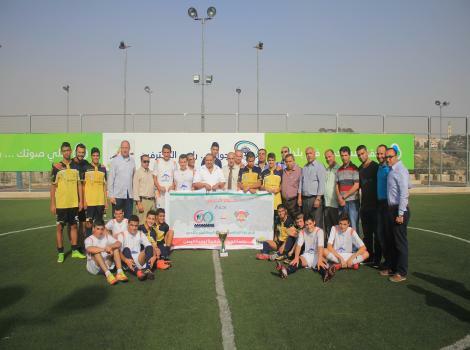 The match was between the Dean of Palestinian Clubs Gaza Al-Riyadi, established in 1934 and the Dean of Jerusalemite Clubs Al Muazzafin, established in 1955. Both teams competed to win the cup of Qudsuna Gathering as a support for solidarity and unity of the land and as a refusal of the temporary state initiated by Dr. Jamal Al-Jawarish. The event started with a welcoming speech by Burj Al-Luqluq Executive Manager, Muntaser Edkaidek, who welcomed the official and “Honorary” presence of Gaza Al-Riyadi team. In addition he thanked the supervisor of this even, Nihad Zughayyar. He also expressed that Burj Al-Luqluq is for all Palestinian and Jerusalemite people. Gaza Al-Riyadi won the game, which was filled with high competitive, by scoring 5 goals while the other team scored only two.